The morning tour is one of our favourites! Paddling off early for Comino Island means you can enjoy the Blue Lagoon when it's still relatively quiet. 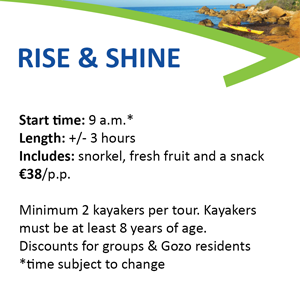 Or get a head start on the crowds and kayak around Dwejra Bay in the shade of the towering cliffs. With the Rise & Shine Tour, you'll have the rest of the afternoon for lunch and land-based sightseeing. Wherever the wind may take us, you are sure to enjoy an amazing adventure on the crystal blue waters of the Mediterranean Sea. Where will your adventure take you? When making an inquiry, please tell us the size of your group and what date you would like for your tour. The morning tours usually begin at 9:00 am, every day of the week, and they last about 3 hours. If you need transport on the day of your tour and you book at least one day in advance, we'll either pick you up from the ferry at Mgarr Harbour (if you're coming from Malta) or from another nearby location in Gozo, such as the nearest village square. We'll provide you with all the kayaking equipment you'll need as well as fresh fruit, a snack, a half-litre of water and the use of a dry bag and snorkel set. Be sure to bring sunscreen, your sunglasses, protection for your head, a pair of shoes you don't mind getting wet and at least 1.5 litres of water for each person in your party. After the tour, we'll bring you back to the ferry or other location in Gozo, but this time happier and full of amazing stories! Possible tour sites or launch points could include some of the following: Comino Island/Blue Lagoon, San Blas, Ramla Beach, Hondoq, Mgarr Harbour, Mgarr ix-Xini, Dahlet Qorrot, Marsalforn/Qbajjar, Wied Il-Ghasri, Fungus Rock/Dwejra Bay, Xlendi, Qala Point. We do our best to accommodate your wishes, but all tours are weather dependent and will be confirmed one day before the tour begins when possible. Kayakers must be at least 8 years of age. Minimum of two kayakers per tour (single kayakers can join an existing group). Single and double kayaks are available. Payment is made in cash after the tour. Be sure to let us know if you have any special dietary needs. We are vegetarian, vegan and gluten-free friendly! Although we do our best, we cannot guarantee transport in Gozo if you book less than 24 hours in advance.